I'm excited to show you my latest project. It's a library pocket with an insert. I've had the template for this since last year. I downloaded it from Mirkwood Designs and then never used it. 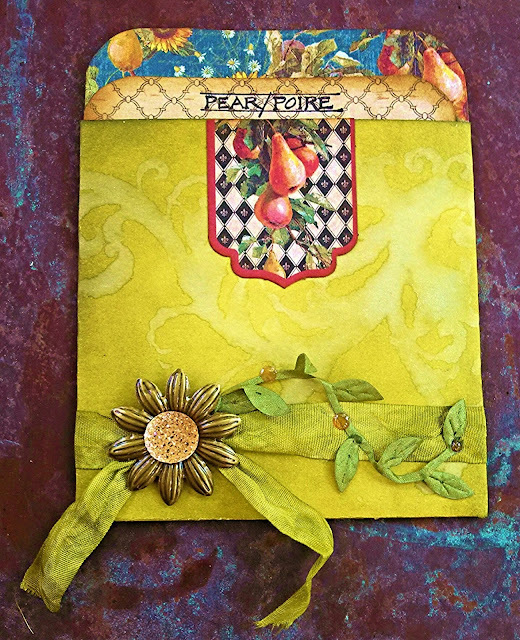 But, I've been wanting to make a pear themed project with the Graphi45 French Country papers and I thought of the library pocket. I love those papers and since my inspiration is moving into late summer/Fall mode now I think they're perfect for this time of year. I also have a new pear stamp I've been wanting to use, so everything seemed to come together and I created this. I traced the template onto a manila folder and cut it out. I inked it with Distress Ink and then used a technique I learned from Wendy Vecchi last year. You spray water, or water and Perfect Pearls, on your craft sheet and then stamp into the water. Then you stamp your tag, or whatever you're working on. You end up with a bleached effect that is very cool. If you used Perfect Pearls as well as water, you have a slightly pearlized effect. I did use the Perfect Pearls but it's hard to see the effect in the picture. I used the same technique on the back with a different stamp. I used a die cut from the French Country cardstock collection and attached it to the top edge of the pocket. I then folded the side tabs back and embellished the back and used the distress banners die to make a label. To finish the front I used Distress Ink to dye a ribbon and tied it around the pocket. I put a brass flower which Linda from The Funkie Junkie Boutique sent me on top of the knot and put a sparkly center on it. I used some green leaf trim to spill over the ribbon and attached some "rain drop" stickers to it. The insert is where I got to use my lovely pear stamp. I stamped it on card stock that I inked with Vintage Photo Distress Ink. Then I watercolored it using Distress Ink in various colors. I tore it from the piece of card stock and put it on a piece of French Country paper which was layered on another paper from the collection which I cut to fit the pocket. I used one of the French Country stamps at the bottom of the insert and I used another Tim Holtz stamp to add the Pear/Poire name to the top of the insert. So, there you have it. 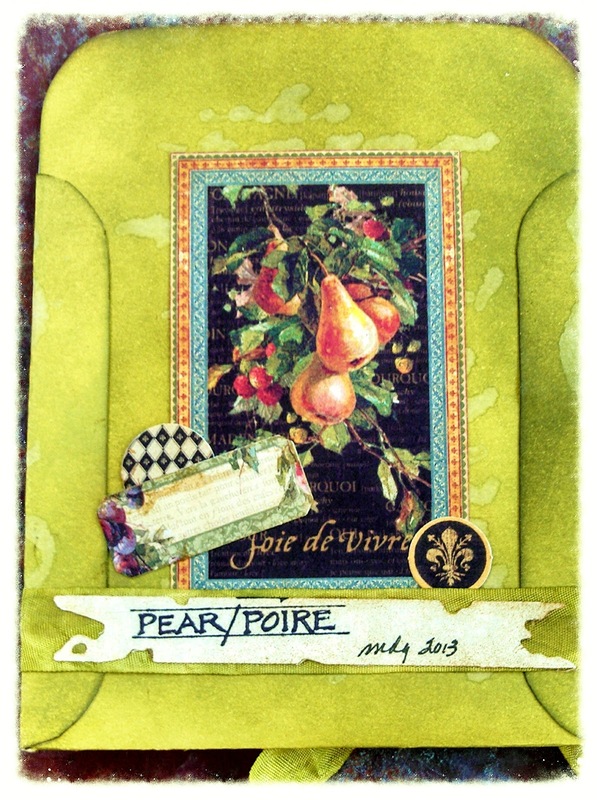 I love the papers and I love pear motifs for this time of summer. I got to use both my pear stamps and some of my favorite papers. Since this project is a folded piece I'm entering it in the Frilly and Funkie challenge which is Any Way You Fold It. I hope you have a wonderful day. Thank you for stopping by for a visit. I'll be back soon with, surprisingly, some new jewelry! I love it! It came together really nicely. Your watercoloring looks great, and I like that template. 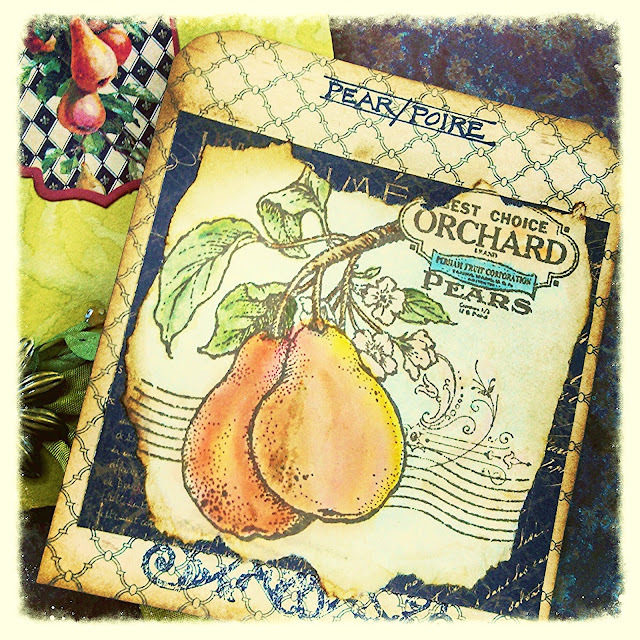 Small note, though... isn't the "Pear/Poire" from a Michelle Ward stamp that Stampers Anonymous brought back as one of Tim's favorites? That is absolutely gorgeous, I love anything pear and you have captured them so well. Your colors re just beautiful, late summer early fall. A real work of art! The colors in this piece are absolutely amazing! I really love your placement of the brass flower with the ribbon! Best of luck with your entry!!! A great library pocket project!! Love the colors, distress stamping and imagery and I'm So glad you're playing with us at Frilly and Funkie!!! WOW! Absolutely gorgeous! I love everything!!!!! This is beautiful Maryanne. Love the colours used and the papers are gorgeous.